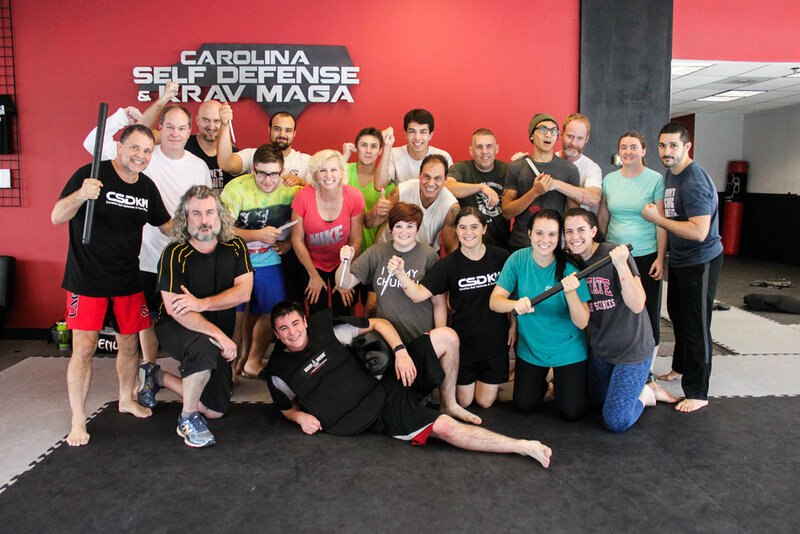 Welcome to Carolina Self Defense & Krav Maga, the Triangle’s best Krav Maga and self defense school! As a self-defense system, Krav Maga is well-known for its brutal counter-attacks, training for multiple attackers, and the ability to end fights quickly. It is designed so that anyone regardless of age, gender, and fitness level can use these techniques and defend themselves successfully. Fitness is a key component of self-defense, as well as overall health. Our instructors are there to guide you through your fitness journey to challenge and push yourself to the best shape of your life. This training is a full body workout that will make you stronger and faster through resistance training, cardio and calisthenics. The best way to win a fight is to avoid it in the first place. Alongside the rest of your training, classes will educate you in situational awareness, fighting tactics, how to identify and avoid dangerous situations, and how to de-escalate conflicts effectively before they become violent. LEARN KRAV MAGA FOR THE SUMMER - 3 MONTHS FOR ONLY $349! A parent or parents can sign up with their student and take advantage of the same special. My family has dabbled in Tae kwon do and other martial arts, but nothing has grabbed my kids’ attention like Krav Maga. We first visited Carolina Self Defense and Krav Maga several weeks ago, not quite sure what to expect. To be honest, I was picturing a bunch of beefed-up military types with bad attitudes! Nothing could be further from the truth. My son and daughter’s trial class was in fact taught by a young woman (there are several female instructors), and everyone in attendance was friendly and outgoing. Class began with a warm-up, and then dove right into some training, drills, and self-defense techniques. There are no fancy, acrobatic kung-fu moves, just instinctive movements such as punches, elbows, and knees to deflect attacks and protect yourself. Class was fast-paced and intense, yet lots of fun, based on the smiles I saw on students’ faces. Oh, and it is a workout. You will be killing some major calories! I LOVED it!! I had to sit down a few times at the beginning to catch my breath lol. I’m so out of shape, and I also had a few past injuries that I had to watch out for...so I will take it slow and steady. 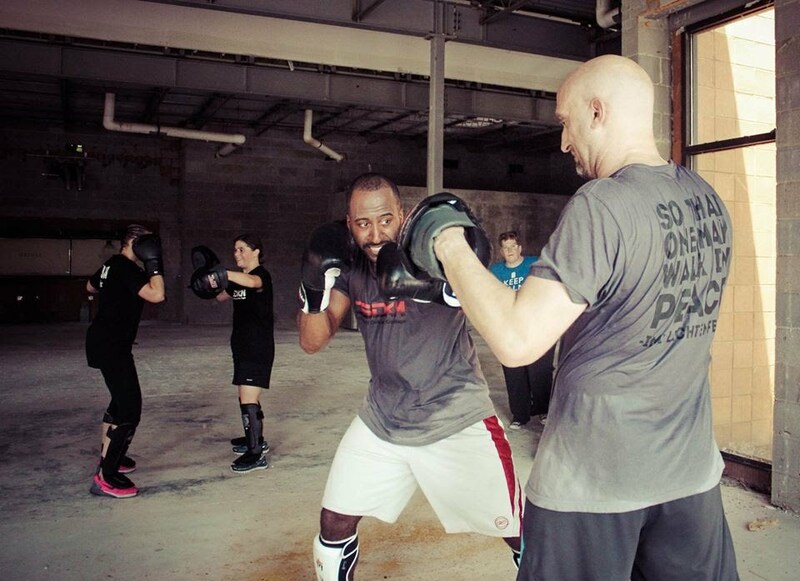 I’ve been a member at Carolina Self Defense & Krav Maga for over a year now. I’ve come to expect that every class will be a challenge and that I will leave feeling exhausted but accomplished. What a great group of people - both the students and instructors. You’ll receive no slack, but at the same time the instruction is positive and fun. The workouts can be intense. With a little consistency in attendance I’ve been able to get in the best shape I’ve even been in, have learned how to throw a decent punch, and I feel better than ever about my ability to defend myself or my family if needed. They’ve recently added kids classes to the weekday schedule, and my 7-year-old LOVES it. They teach appropriate self defense and general athleticism in a really fun atmosphere. I’ve been at Carolina Self Defense & Krav Maga for a little over a year and I can honestly say it’s one of the best decisions I have ever made! I would never have thought I’d find myself doing something like krav but it has been a great way to push myself out of my comfort zone and has resulted in me feeling stronger, empowered, and more confident. You are pushed to your mental and physical limits, but in a safe, positive way. Every instructor there is great, each one has a slightly different style, and that diversity of approaches definitely benefits you as a student. It is obvious that the instructors sincerely care about how we’re doing and want to give us the tools to protect ourselves if we ever find ourselves in a dangerous situation. It was a pleasant surprise that there is no macho posturing or competitiveness among the students, but that it is a fun, friendly, supportive community. If you’re curious about krav, give it a try, you may love it and CSD is the best place to go to train. Carolina Self Defense & Krav Maga does not discriminate on the basis of race, color, national origin (ancestry), religion (creed), gender or gender expression, sexual orientation, marital status, age, height, weight, physical or mental ability, disability, or military status, in any of its activities or operations.